Although I always review pancakes at restaurants that locals frequent, last Wednesday was an exception for more than one reason. 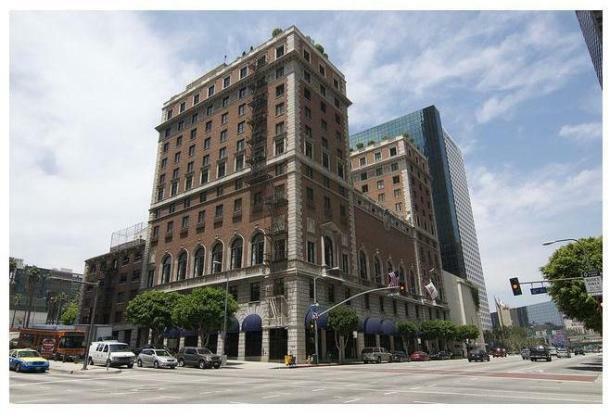 A couple of weeks ago I received a phone call, followed by a breakfast invitation, from the Director of Operations at the Jonathan Club, as he claimed the Club has the best pancakes in all of LA. While I was extremely flattered that the Director thought of Ma’amCakes for this invitation, the skeptic New Yorker in me surfaced before the words of gratitude could, and I somehow replied with, “That’s a pretty bold statement to tell a pancake reviewer!” A week later I found myself in Downtown LA, walking through the historic doors of the Jonathan Club, a private, members-only social club. 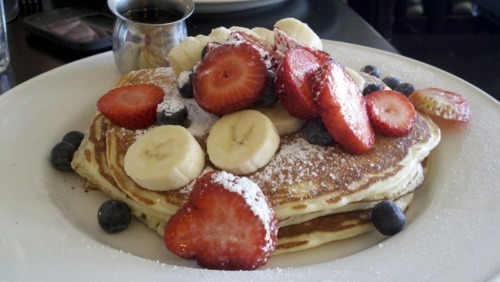 The Jonathan Club, which also has a Beach Club location in Santa Monica, was established in 1894 as a political group, and at one point, even had Ronald Reagan as a member; needless to say, I had to put on my fancy-pancake-pants for this review! 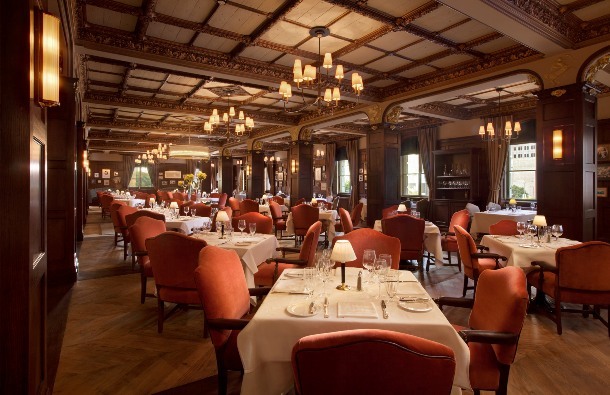 With one glance of the 50ft ceilings, sparkling chandeliers, and custom-carved wooden walls, I had to catch my breath for a second as I was suddenly powerfully aware of the Club’s prodigious history. 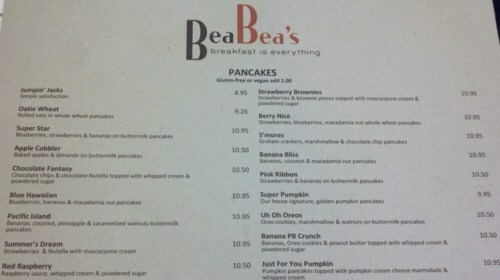 As I sat in the booth with the Director, I soon realized it was the first time I’ve reviewed pancakes for dinner! Before I could become any more astonished, a platter of three different types of pancakes was placed in front of me by the Chef himself, Jason McClain. 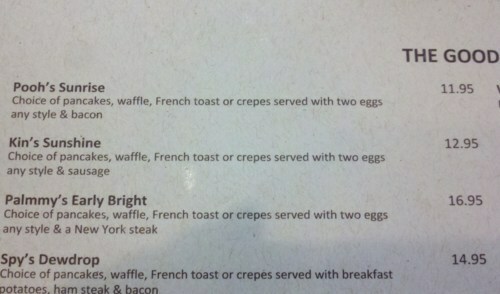 For a moment there, I thought I was having a hotcake hallucination! 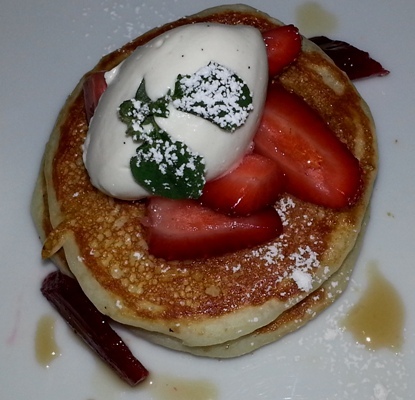 The first pancake, The Strawberry Rhubarb Pancake, tasted very similar to strawberry shortcake, and even had sweet cream on top. The tenderness of this pancake kept me wanting more, even after I’d already taken my last bite. The second pancake, The Caramelized Banana Pancake, had a fiery crispness on the top, almost like that of creme brulee, and continued to warm my heart with every bite. 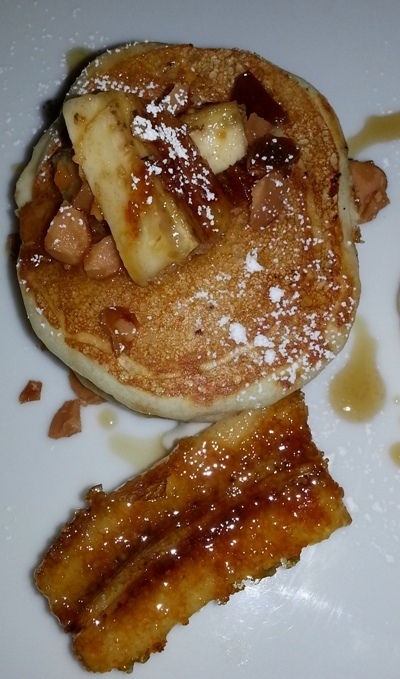 The combination of the soft pancake with the banana, and sweet & crunchy caramel top, is a dish that still makes my mouth water when glancing at its photo. The third pancake, Robby’s Buttermilk Pancake, actually gets its name from Robby’s Pancake Mix– a trick I learned from Jason himself. 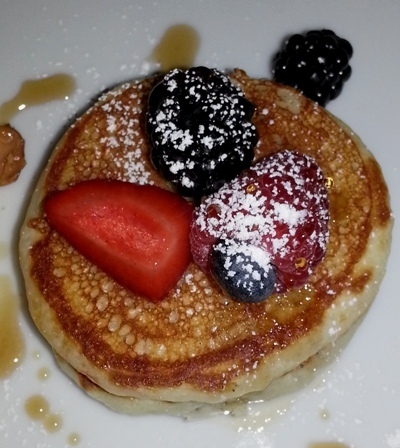 Although the mix may technically belong to Robby, the twist put in the recipe to make a traditional buttermilk pancake taste so delicious, is a credit that Jason fully deserves. 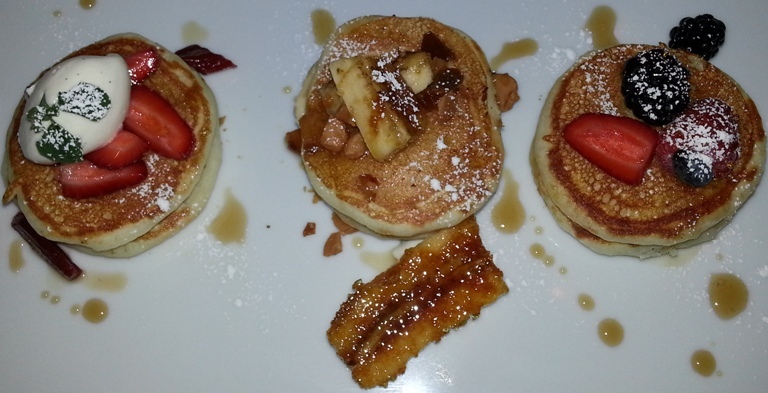 And in case you were wondering, my favorite of the three pancakes was… The Caramelized Banana! 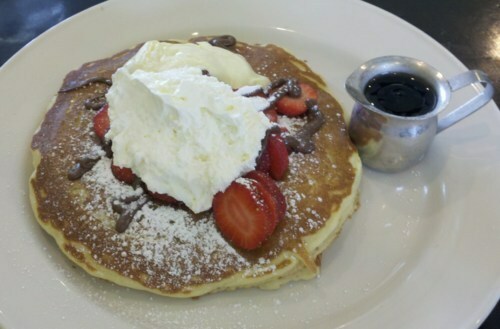 Overall, the pancakes at the Jonathan Club were certainly on par with the best pancakes in Los Angeles. The service I experienced definitely validated the exclusivity and standards of excellence in which the Jonathan Club prides itself. I wish all you FanCakes could visit the restaurant, and taste the pancakes for yourselves; however, last week’s review wasn’t just about the pancakes, but it was also about some Food for Thought. As a blogger, particularly as a blogger with an additional full-time job, you constantly wish as much time could be devoted to your blog as that towards your career. As a result, it can get somewhat discouraging if, for example, your traffic isn’t always as high as you’d like it to be. While I have had some incredible experiences thus far in my Ma’amCakes journey, receiving that phone call from the Director of Operations at the Jonathan Club was one of the most rewarding. That call proved that whatever frustrations you have along the road of blogging, you never know who is viewing your project, and what can potentially come of it. If I had to create a title for the plated pancake feast I had last Wednesday evening, I would call it: Grateful Glamorous Griddlecakes. For information on how to become a baller – er, Member of the Jonathan Club, click here. 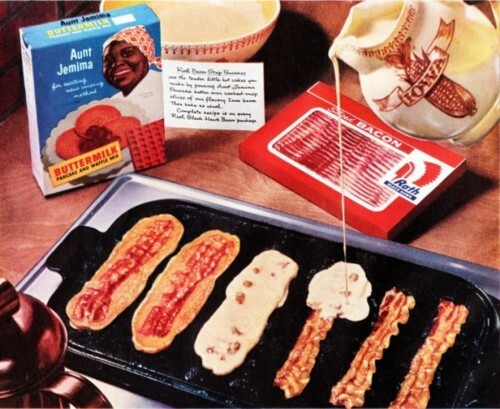 Aunt Jemima’s Idea of Bacon Ma’amCakes! Enjoy Some This Weekend! 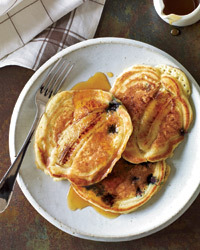 Check Out This Great Blueberry & Banana Pancake Recipe from Food and Wine Magazine! Perhaps Breakfast in Bed for Mamma this Weekend?? So Glad Grub Enjoyed Their Review! Well, Toast Enjoyed the In the Mix Review, AND Took Jessica and My Suggestion of Having the Option to Include Fruit Inside the Batter. 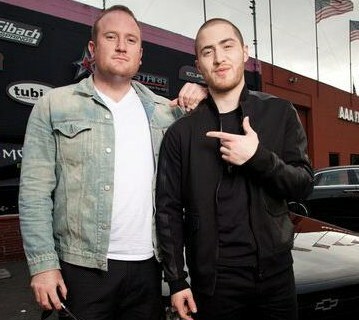 Awesome, Toast! Looks Like Toast is Excited for Ma’amCakes’ Review!